Symbiosis Institute of Operations Management, Nashik was in full swing on the 11th, 12th and 13th of August 2016, when it organized the coveted International conference on Supply Chain Management. It was an event which brought together Management professionals from the industry, academicians, research scholars, students, entrepreneurs, business leaders and basically anyone who wanted to be a part of the conclave of the technocrat pool. 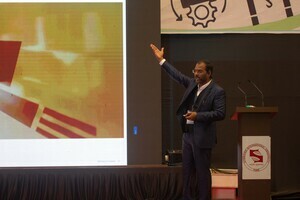 The theme of the conference was – ‘Contemporary Trends in Supply Chain Management’. The first day saw a warm welcome to all the guests, Director, faculty and students. Welcome speeches were given by the Director, Dr Vandana Sonwaney and Convener Dr. Rohit Singh. Soon after, Ms Neelam Singh, Senior Analyst, ARC advisory group delivered her talk on Megatrends in logistics and Robotics and Automation. Next to speak was Dr. Neuman Pujawan, ITS Indonesia focusing on uncertainties in handling the logistics sector, Prof. Kamapan Mukherjee, Dean IIM Kashipur who threw light on Sustainability in Operations management and related issues, and Prof. Padmanav Acharya, NITIE Mumbai speaking on Systems modeling in Supply chain management. This was followed by a number of students and academicians presenting their Technical papers. Finally the evening ended with a Corporate Dinner organized at Express Inn, Nashik for all delegates. Day 2 began with a warm welcome and short recapitulation of the previous day. Prof Jaideep Motwani of Seidman college of Business, USA, started the day with his speech on the New Supply Chain agenda: rom boardroom to classroom, followed immediately by Prog Manoj Kumar Dash from IIIT Gwalior talking about data analytics for Supply Chain decisions. Technical paper presentations dominated the day with students and faculty presenting their paper. The end of the day saw Ms Ramya Mishra, Director PR365, who spoke on the importance of PR in the success of any brand. The est of the evening was joyfully spent with York Tour and Networking Dinner on campus. The final day of the conference was the most scintillating out of the three with industrialists delivering their speeches on varied topics of current trends particularly which an operations manager would be interested in. In the beginning we had, Dr. Praveen Gedam, Transportation Commissioner Mumbai who elaborated on the issue of Project Management, the project being – ‘Conducting the Kumbh Mela on the banks of River Trimbak’. The project was a hugh task but also a successful one with preparations beginning almost an year earlier. Following Mr Gedam, we had Mr. PB Joshi of HAL who elaborated on the procurement Management in HAL, Mr Naval Sabharwal speaking on Contemporary Research Trends in Supply Chain Management, Mr Sony Thomas from Caterpillar, who spoke on Supply Chain Design Trands, Dr, Rajeev Papneja from EDS Software solutionswho threw light on the Role of Cloud Computing and Big Data Analytics in SCM, young Mr. Vijay Varada from Fractal Works who illustrated on 3D Printing demonstration and how his company grew and still continues to do so, Mr. Subhasish Roy of NEC elaborating Best practices at NEC and finally Mr. Mohan Raghavan from Mahindra and Mahindra who spoke vividly on the impact of GST on Overall Business. The conference ended with a Thank You note to all guests. The hardwork of all students and faculty ws commendable and after delivering a successful show the students promised the next batch to get ready for ICOSCM 2.0!